Plains Podiatry Associates – Podiatrist, Lubbock, Plainview, TX - Mark A. Barinque, D.P.M. 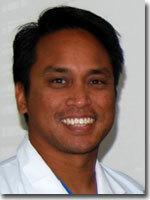 Dr. Mark Barinque was born 1966 in Ft. Leonard Wood, MO. The last name Barinque is French derived and is a village located in the Pyrenees region of France. Dr. Barinque's parents were born in the Philippines and immigrated to the United States shortly after World War II. His grandfather was a survivor of the Bataan Death March. Dr. Barinque grew up in Missouri and Colorado and attended high school in Colorado Springs and college at Colorado State University in Ft. Collins, CO. He received his medical training in Des Moines, IA where he received his Doctor of Podiatric Medicine degree in 1993 at the University of Osteopathic Medicine and Health Sciences (now Des Moines University). He completed residency training in 1995 at John Peter Smith Hospital in Ft. Worth, TX. He met his wife, Romola, at the University of Osteopathic Medicine and Health Sciences and has been happily married since 1994 and enjoys the "organized chaos" four girls and one boy brings to their lives. Outside of his podiatry practice Dr. Barinque is a track and field enthusiast, plays competitive basketball, tennis, and flag football and competes in local and out of town tournaments when his family schedule allows. He also helps coach his kids in basketball, tennis, and football. He is an avid outdoorsman enjoying fishing, camping, skiing, hiking, trail running, road and mountain biking. Dr. Barinque is Board Certified in Foot Surgery and specializes in surgical correction of bunions, hammertoes, heel pain, and other orthopedic foot problems and also has interests in diabetic foot care with an emphasis on preventative care. He practices conservative medicine first before considering surgical treatments. Dr. Barinque has a special interest in sports medicine given his long interest and active participation in sports at the high school, collegiate and weekend warrior level. Dr. Barinque himself has experienced many foot injuries competing in sports and can appreciate his patient's desire to return to their normal activities free of pain.